Lull Mattress is taking the sleep world by storm as they outperform and outsell some of their biggest competitors on the market. 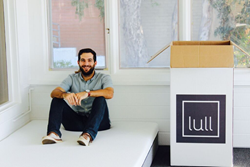 After opening their doors for business in November 2015, Lull Mattress has quickly made a name for themselves as the purveyors of quality, made-in-the-USA mattresses delivered right to your door. People buy their clothes online, their wine online, and even their groceries online, so why not their mattresses? At Lull, they saw the internet marketplace as the perfect opportunity to offer consumers a quality product at a pocketbook-friendly price. They cut out the time-consuming search, the middleman, and the markups that make mattress shopping one of the most dreaded and expensive experiences on everyone’s to do list. The key to their popularity lies in their mattresses’ innovative three layer composition, which makes them the perfect fit for side, back, and even stomach sleepers. Cooling Comfort – This gel-infused layer contours to the body and enhances airflow, thereby reducing those sweaty midnight wake ups. Therapeutic Pressure Relief – This proprietary foam layer helps establish optimal alignment for healthy relaxation of the body's muscles, tendons, and ligaments. Exceptional Support – This hard-working layer is crafted from high quality, durable foam for a satisfying snooze year after year. Unlike the big box mattress stores, Lull ships their product directly to their customer’s door free of charge. Their compression technology roll-packs each mattress into a box the size of a mini fridge. “This means your mattress is easy to ship and handle, but also leaves the smallest carbon footprint possible–reducing package volume by up to 70%,” stated Klein. If for some reason the customer isn’t satisfied after the 100 night trial period, they’re guaranteed a full refund and free pickup. Lull is the stress free, fuss free, and risk free way to get the restorative sleep needed to take on the day. The Lull Mattress is available exclusively online starting at $500.